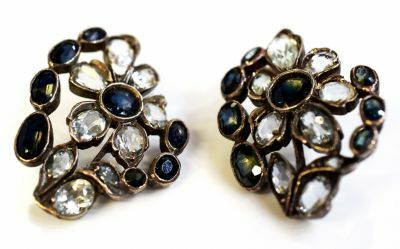 A wonderful pair of antique 9kt yellow and white gold openwork stylized floral earrings, featuring 14 oval faceted cut medium-to-deep blue sapphires, est. 16.93ct; 2 round faceted cut medium blue sapphires, est. 4.35ct; 16 oval faceted cut pale-to-light blue aquamarines, est. 10.14ct; 1 round faceted cut light blue aquamarine, est. 0.05ct and 1 pear faceted cut light intense blue aquamarine, est. 1.29ct.